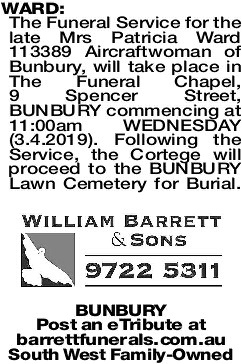 The Funeral Service for the late Mrs Patricia Ward 113389 Aircraftwoman of Bunbury, will take place in The Funeral Chapel, 9 Spencer Street, BUNBURY commencing at 11:00am WEDNESDAY (3.4.2019). Following the Service, the Cortege will proceed to the BUNBURY Lawn Cemetery for Burial. 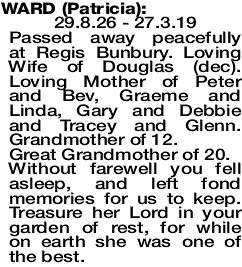 29.8.26 - 27.3.19 Passed away peacefully at Regis Bunbury. Loving Wife of Douglas (dec). Loving Mother of Peter and Bev, Graeme and Linda, Gary and Debbie and Tracey and Glenn. Grandmother of 12. Without farewell you fell asleep, and left fond memories for us to keep. Treasure her Lord in your garden of rest, for while on earth she was one of the best. Much loved Mother to Gary and Debbie. Adored Nanna of Kylie, Renae, Jayden, Kymm, Kale and partners. Great Nan to 10. 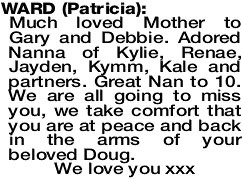 We are all going to miss you, we take comfort that you are at peace and back in the arms of your beloved Doug. Dearly loved sister of Molly and loved aunty of Claudia, Laurie, Karen and families. Our deepest sympathy to the family. Many happy memories. 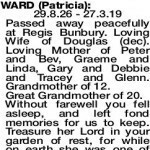 WARD PATRICIA Deeply saddened by the loss of our dear Nanna. RIP. Jason, Liliana, Jake and Jesse Battle. 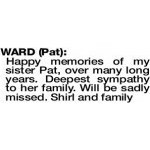 WARD PATRICIA A lovely Aunt who will be missed. Sympathy to the Battle and Ward families. 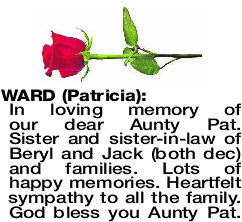 RIP Aunty Pat. Love Jenny, Murray, Brett and families. 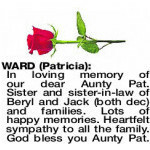 In loving memory of our dear Aunty Pat. Sister and sister-in-law of Beryl and Jack (both dec) and families. Lots of happy memories. Heartfelt sympathy to all the family. God bless you Aunty Pat.